Everybody wants to get off to a good start. History shows that teams that are victorious in their season openers are more than twice as likely to reach the playoffs than Week 1 losers are. But that doesn’t mean an 0-1 start is impossible to overcome as nearly 25 percent of teams that lost the opener went to the playoffs. After three AFC West teams made the playoffs last season two of those three and three of the teams in the AFC West began the season with Week 1 losses. Can you guess which team started 1-0? The top fantasy back in many leagues was a forgotten man in the KC offense. Jamal Charles touched the ball on the first three plays of the game but after that, hardly at all. He would carry just four more times for a grand total of 19 yards and he had four receptions for 15 yards. His 11 total touches are his fewest since Week 8 of 2012 (eight touches vs. Raiders), and he had just four total touches in the second half. Not using Charles or at least the running game shows HC Andy Reid hasn’t learned anything or is a very stubborn man. Reid could have referenced his days in Philadelphia when he refused to run on many occasions to either rest his defense or protect leads late in games. If that was too far to go back, Reid could have referenced last year’s AFC Wild Card playoff vs. Indianapolis. The Chiefs simply refused to run the ball in the second half with a 21 point lead. Defensively, the Chiefs allowed 405 yards of total offense to a Jake Locker led offense. Locker picked apart a Kansas City defense that lost Pro Bowl linebacker Derrick Johnson and starting defensive tackle Mike DeVito to Achilles injuries. The Denver Broncos held on to beat the Indianapolis Colts 31-24 on Sunday night, as Peyton Manning tossed three first-half touchdown passes to tight end Julius Thomas. The Broncos raced out to a 24-0 lead, as the $100 million dollar defensive makeover looked worth every penny. Colts QB may not be No.18 but he is certainly starting to take over the league as the best young signal caller. Luck ended with 370 passing yards but he tossed two INT’s and was sacked three times. The new defense did step up when it mattered. The Broncos intercepted or defended seven passes by players in coverage in the final 10 minutes of the game, more than any other team since 2006. No Wes Welker, no problem. 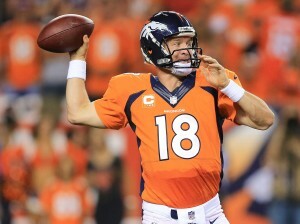 Manning utilized a short passing attack, as 23 of his 36 passes (64 percent) traveled five yards or less downfield. He was 16-of-23 on such throws, including 4-for-4 and two touchdowns when targeting TE Julius Thomas. Last season, Manning led the NFL in short pass attempts (373) and completions (283). He also had 29 Pass TD on such throws last season, 13 more than anyone else did. Speaking of Julius Thomas, he was named AFC offensive player of the week. Thomas had seven catches for 104 yards (14.9 average) and a career-high three TD’s. His three touchdowns, which all came in the second quarter, led all NFL players on Kickoff Weekend and tied Pro Football Hall of Famer Shannon Sharpe for the Broncos’ single-game record for touchdown receptions by a tight end. Thomas is the first tight end with three touchdown catches in one quarter since 1997, when ironically another Manning disciple, Colts TE Ken Dilger, did against the Dolphins. However, Manning wasn’t under center until 1998. Current 49ers head coach Jim Harbaugh connected with Dilger on that day, as Indy blanked Miami, 41-0. Broncos defensive coordinator Jack Del Rio may look to take advantage of a new revamped offensive line with his new high-priced star laden defense. The Chiefs have just one offensive lineman — center Rodney Hudson — who is starting in the same position for the team that he played last season. Reid may try to get Alex Smith and Jamal Charles on track using the screen game and a steady diet of quick hit plays against what could be an aggressive front seven. Andy Reid has an extensive screen game in the offense and the Chiefs run many of those screens, to either side of the field, to a variety of players, when they all look the same at the start of the play. The Broncos’ linebackers will have to be disciplined in their pursuit. Charles has a good chance of having a big game today against the Broncos in Denver if you believe history is a good teacher. In 2012, Charles had just six carries in a September loss to the Buffalo Bills. Next came a 233-yard, one-touchdown game against the New Orleans Saints. But later that season, he followed a five-carry game against Oakland with just 39 yards against San Diego. However, in December of that same year, Charles rushed for 226 yards and a touchdown against Indianapolis a week after carrying nine times against the Raiders. Then, last season, Charles followed an eight-carry game against the Raiders with 106 yards and a touchdown against the Colts. The Broncos offense should continue to roll today. Last season vs. a better Chiefs defense, QB Peyton Manning threw for 323 yards and a touchdown in a 27-17 victory over previously undefeated Kansas City on Nov. 17 and 403 yards and five TDs in a 35-28 win Dec. 1. Last week No.18 became number two (65,233) NFL history with 65,000 career pass yards and has now defeated all 32 NFL teams, tied with Favre for most of any QB in history. In 12 career games vs. KC (incl. 2 playoffs), Manning is 11-1 record (.917) with 3,530 pass yards & 24 TDs with 98.3 rating. He Needs 6 six TD passes to reach 500 in his career and don’t be surprised if he gets four or five of them today. You know what to expect from Denver but what’s happened to KC. The feel good team from last season isn’t feeling very good these days. Since their 9-0 start last season they’ve gone 2-7, including their collapse in the playoffs against Indianapolis. Their offensive line is bad, quarterback Alex Smith is throwing interceptions in uncharacteristically high numbers, running back Jamaal Charles didn’t get the ball much against Tennessee, some of their best young players aren’t contributing much, they lost two of their best defensive players for the season with injuries last week and their defense got pushed around by Jake Locker and the Titans. Imagine what Peyton & company are going to do. After Tough Monday Night Loss, Chargers Host SB Champs. The Bolts lost a heartbreaker, falling to the Arizona Cardinals 18-17 in the season opener. The Chargers opened the second half strong with 14 straight points to take a 17-6 lead heading into the final quarter, but the Cardinals scored 12 straight to end the game and escape with the win. Against a good Arizona defense on Monday Night, the San Diego chargers struggled. Phillip Rivers and company produced only 290 yards of offense, including just 52 rushing yards, San Diego’s lowest total since Week 5 last season. Philip Rivers was held to 80 yards in 1st half, which would have been his lowest 1st-half passing total all of last season. Rivers also only completed 50 percent of his passes. 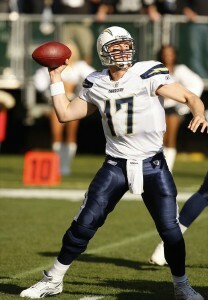 Rivers completed less than 60 percent of his passes only once last season – Week ones loss to the Texans. The Chargers are the first team in the Super Bowl era to lose back-to-back season openers in which they led by double digits heading into the 4th quarter and since the start of the 2012 season, the Chargers have lost 5 games in which they led by a touchdown or more in the 4th quarter. That is tied with the Lions for the most such blown leads over that span. Following a disappointing effort rushing the ball when they averaged 2.2-yards per carry, the Chargers hope to establish the run behind Ryan Mathews, Danny Woodhead, and Donald Brown. Philip Rivers explained that the offense also needs to do a better job sustaining drives and converting on third down. All eyes will also be on Rich Ohrnberger who takes over at center for Nick Hardwick, who suffered a season ending neck injury. Philip Rivers’s resurgence in 2013 was due in part to the short and simple approach of the Chargers methodical offense. Rivers completed 76.1 percent of his short attempts (throws 10 yards or fewer downfield) as San Diego led the NFL in third-down conversion rate (49 percent). Rivers was among the most effective third-down quarterbacks in the league. He completed a league-best 64.7 percent of his throws on such downs, while his 81.3 Total QBR was the best among quarterbacks to start all 16 games last season. Rivers must keep it simple today but he must also be quicker getting rid of the football. Rivers effectiveness may be easier said than done. The Seahawks defense, with a secondary known as the Legion of Boom, is pretty good. Since the start of last season, the Seattle defense is the best in the league at containing the short passing game. Seattle’s defense has limited opponents to 1,106 yards after the catch on short passes (or 4.2 yards after the catch per reception), both best in the league since 2013. 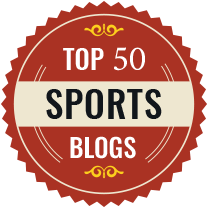 Perhaps the best display of the Seahawks dominance in the short passing game came in Super Bowl XLVIII. Peyton Manning ranked first or second in the league in completion percentage (74.5), yards per attempt (6.6), touchdowns (37) and Total QBR (79.5) on short passes last season. Meanwhile, Broncos receivers led the NFL in yards after the catch, recording more than 250 such yards than the next closest team. During the Super Bowl, the Seahawks let Manning check down all day. Short passes accounted for 78 percent of his attempts, on which he completed 78.9 percent of the time. However, the Seahawks held the Broncos to only 3.6 yards after the catch on those passes, the lowest mark of the season for Denver. Seattle also held the Broncos without a touchdown on short passes for only the second time all season. These two teams met in the preseason and the Chargers are hoping for a better effort, especially on defense. Russell Wilson passed for 191 yards, ran for two touchdowns, and led scoring drives on each of the four series he played in the Seahawks’ 41-14 win. RB Marshawn Lynch rushed 20 times for 110 yards and two scores and WR Percy Harvin had 59 yards receiving and 41 on the ground. The Chargers realize they will have their hands full with the Seattle offense as they look to avoid their first 0-2 start since 2008. Last week, the Raiders traveled to New York to take on the Jets in their season opener, falling 14-19. 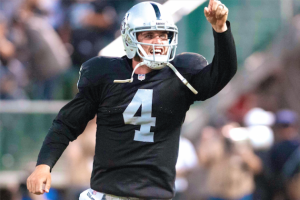 The Raiders were led by rookie QB Derek Carr, who made his first NFL start and became the first rookie to start for the Raiders Week 1 in the Super Bowl era. Carr threw for 151 yards on 20-of-32 passing with two TDs and a 94.7 quarterback rating. It was clear in the Raiders 19-14 loss that the playbook was completely open for Carr, the first quarterback of his class to play. Just a few of Carr’s 32 pass attempts went longer than 10 yards downfield. Pro Football Focus said 17 of Carr’s 20 completions came within 10 yards of the line of scrimmage, while a whopping eight of the completions were thrown behind the line of scrimmage. While Oakland’s game plan was measured, short passes were plentiful in the first 14 games of the NFL season. According to ESPN Stats & Information, the average distance of passes in those games was 7.85 yards. The average was 8.19 yards last season. WR Rod Streater was the team’s leading receiver, hauling in five receptions for 46 yards and one TD, coming on a 12-yard pass from Carr in the first quarter. WR James Jones caught his first TD pass as a Raider when he brought in a 30-yard toss in the fourth quarter. The defense was paced by LB Sio Moore’s 15 tackles and one sack. S Charles Woodson added an interception that led to a Raiders score, and S Tyvon Branch recorded one sack of his own. With 10th straight Loss vs. Texans, could Dennis Allen be on a very hot seat? It will be a tough chore against a stout Texans defense but the Raiders must get their ground game on track. This is supposed to be the strength of the team—it was anything but last week vs. the Jets. The Raiders had just 25 rushing yards. New starting tailback Maurice Jones-Drew had 11 yards on nine carries. The Raiders will make rookie quarterback Derek Car’s life miserable if they can’t establish a running game. A 25-yard ground game will simply not work with a young quarterback. It seemed every time Jets QB Geno Smith completed a pass, NY receivers had plenty of room to run. The secondary play has been an issue in Oakland in recent years, and it wasn’t very good last Sunday. The Raiders didn’t have much of a pass rush, either, which is also a problem. But Houston’s receivers can’t be given big cushions. 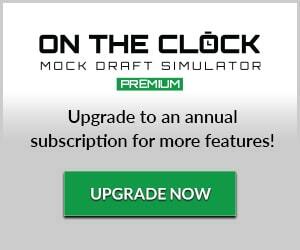 They must get to the very Ryan Fitzpatrick, the Texan QB. Fitzpatrick, who started every game for the Buffalo Bills from 2011-12, went 14-of-22 (63.6 percent) with 206 yards, one TD and a passer rating of 109.3 in the Week 1 win against Washington. The Raiders must also contain RB Arian Foster. The Texans lead back, eclipsed the 100-yard mark in Week 1, rushing for 103 yards on 27 carries (3.8 avg. ), adding another 17 receiving yards on two receptions (8.5 avg.). With Carr at QB and speed on the outside, The Raiders should look to get back to an Oakland tradition, throwing deep. Understandably, The Raiders were conservative with Carr as they had him throw several short passes. But if the Raiders are going to keep the Texans — and superstar defensive end J.J. Watt — honest in Week 2, they are going to have to establish a deep threat or the Texans will tee off. Raiders head coach Dennis Allen was hoping that naming Carr to start would spark change and create better bottom-line results. Nevertheless, they are 0-1 and have now lost nine straight games dating back to last season. If the Raiders lose today, Allen’s name could start to creep into conversations about involving head coaches not making it through the season. Oakland had just 158 total yards of offense — 73 of which came on the team’s final drive. It was Oakland’s lowest offensive output since 2009— the JaMarcus Russell era. The question for the Raiders is if Sunday’s bad offensive output was a sign of things to come or if it was simply a slow start for an offense being led by a talented but rookie quarterback?